This robber fly was sitting quite still on the gravel in a fire road at the Claremont Colleges’ Robert J. Bernard Biological Field Station. It was considerably smaller than the other robber flies I’ve seen at the field station. Any information about its identity will be greatly appreciated! Stenopogon lomae, probably a male. Belongs to the albibasis group of Stenopogon, which are all small-sized species, usually around 10mm in length. Stenopogon lomae is endemic to the Los Angeles Basin, and Claremont is where some of the original paratype specimens were collected. Thanks! It’s great to have this one identified to species, which will be a new addition to our field station invert list. 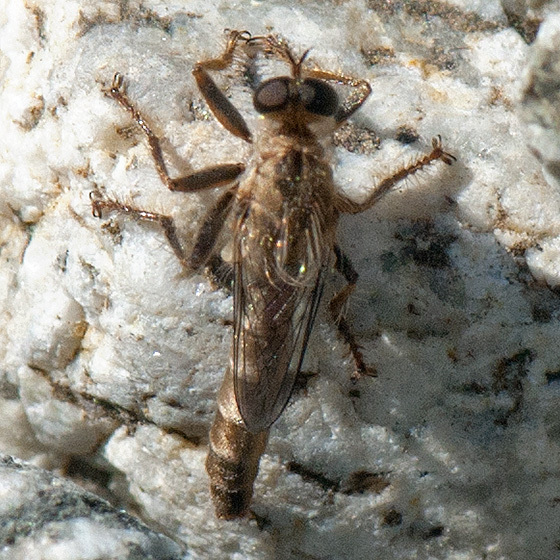 I spotted it sitting on the gravel, and when I bent down to look at it closely, I was surprised to see it was a robber fly because it was so small. I think these very local insects are cool, and it’s neat that some of the original specimens are from Claremont. You're welcome Nancy! These little Stenopogon (albibasis group -- about 9 species) perch on the ground, while many other Stenopogon prefer shrubs. What prey do they prefer? Do you know what prey these little Stenopogon prefer? A lot of prey I’ve seen with the larger robbers are bigger than these little ones? I also see that these are first images of this species for BugGuide, so we have a new page. Nice!